They’re going to have access to our bank accounts? Today, Thursday, 27 Aug 09, Rush Limbaugh told a listener that President Obama’s Administration was going to order the IRS to make banks across the country turn over your bank account numbers to that agency. Rush? How much Oxycontin are you taking each day? More importantly, how much Oxycontin are your listeners taking each day? Limbaugh said, “If this bill passes they’re going to have access to your bank account. They’re going to have digital, on-line access to your bank account. “There are hideous things in the legislation. Nowhere in the Health Care legislation does it give authority to anyone to have access to anyone’s bank accounts. This is a bald faced lie, pure and simple. Limbaugh, the self-proclaimed “truth meter” wouldn’t know a real truthful fact if it walked up and slapped the cigar right out of his face. Sadly our country lost a true American yesterday when Senator Edward Kennedy passed away, and even more sad, we’re still stuck with the likes of Limbaugh, Hannity, and Beck. Six months ago I was sent the gloom and doom predictions of Kit Lange’s, My Predictions for the New Obama ‘Presidency’. It’s now almost seven months into President Obama’s Presidency and I thought we could all revisit Ms. Lange’s predictions and see if the Prophetess of Doom was right or not? As many of you may know, Ms. Lange is reportedly a veteran of the United States Air Force, for which service I would salute her; however as an 18+ year veteran of the United States Army I need to say that not everyone who has served, or who is currently serving, agrees with her particular point of view. “Now that America has shown us all that affirmative action even works in politics, I’ve compiled a list of things that you can probably expect to happen. These predictions are 80% gleaned from information all of us have access to, and 15% gut instinct based on many years of research, historical study, and being glued to current affairs. The other 5% is just anger at my countrymen’s stupidity – I admit it. Six months later still no evidence that these “mass emails” ever went out. Sounds a lot like a Senator standing before the assembled media, holding up a piece of paper in his hand and claiming it contained the names of known communists in the State Department. Now I have to admit the Government had to step in a bail out failing businesses, thanks to the mess Bush/Cheney left – you can’t fight two wars for six years and not raise taxes. Six months later and still no massive Israeli unleashing of death upon Iran, or any of her Arab neighbors; in fact Israeli attacks have seen a decrease in the last seven months. How many times did hostilities erupt during the eight wonderfully enlightened years of Bush/Cheney cowboy diplomacy? Lange? Anyone? Bueller? Lange? There were three major military confrontations during the Bush years, and countless missile attacks and air raids. How many so far during Obama’s Presidency? Lange? Anyone? Bueller? Lange? The answer would be zero. “Israelis want more than anything to live in peace with their neighbors, but Israel also has real – and very dangerous – enemies,” Obama said. Six months later and no Iranian attack on the United States. No other terrorist groups either. Six months after taking the oath of office, President Obama, has appointed the first Hispanic Woman to the United States Supreme Court, Justice Sonia Sotomayor, not a far-left liberal, but a moderate almost conservative pick. Still waiting for the Socialism and Sharia Law to kick in. haven’t seen an veils in the White House yet. 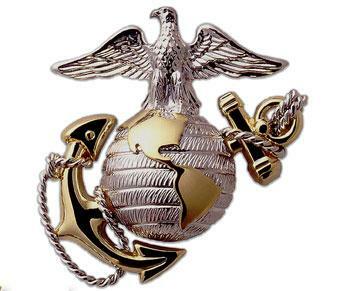 Like everything looked at so far I’m still waiting for the rise in military cases against our troops. As I said in February, under which administration were these “brave and honorable men” accused, arrested, tried and imprisoned? The answer hasn’t changed since then, that would be the administration President George W. Bush. I still can find absolutely no evidence that would lead me – a commissioned officer in the United States Army – to believe that President Obama would continue the Bush Administration’s policies of accusing, arresting, convicting and imprisoning “brave and honorable men”, much less allow it to rise. Still looking for the slow but steady erosion to begin; let’s see, freedoms of free speech are still in place, as evidenced by the “protesting” in town hall meetings, and of course the April Tea Bag events. Everyone still has their guns. Religion is still free, just look at The Family on C Street. Rush and Hannity et al., are still on the air and not in a camp somewhere, that must mean freedom of the press is still in full swing. Haven’t heard of any federal troops being quartered in anyone’s homes yet; and in spite of the best efforts of the previous administration, federal troops are not going into homes without warrants and seizing property. That “slow but steady erosion of rights you have enjoyed for your entire lives”, was stopped on January 22nd. Never in the history of our Republic were you closer to having your civil rights seriously restricted than during the eight years of Bush/Cheney. The passing of the Patriotic Act, Habeas Corpus being ignored – unconstitutionally –by President Bush and his administration, and let us not forget Republican Mitt Romney’s view that it would have been OK to wire tap Islamic houses of worship in the United States? Well, Sarah Palin is claiming that we’re inches away from “Death Panels”, NOT! Well, actually, I have to take that NOT back. We do have “death panels” in America, and Sarah’s little Trig would be in danger under its jurisdiction. It’s in Texas, and then Governor George W. Bush created it in 1999. As was made abundantly clear in February, but warrants repeating here, for eight years the previous administration of President George W. Bush prosecuted a War on Terror that has cost more than $4,000,000,000.00 (trillion) dollars while cutting tax revenues to the federal government. While the War on Terror was certainly warranted and justified, the fact that our country got mired in Iraq, which has cost $3,000,000,000.00 of the $4 trillion, without raising taxes, has effectually bankrupted our nation. You can’t spend $4 trillion dollars without raising income. And while President Bush was spending $4 trillion, and not raising taxes, he failed to increase funding for our nation’s roads, bridges, railroads, airports, schools, libraries, hospitals, etc. Now the bill has come due. Yes, President Obama will no doubt have to raise taxes, but mostly because the last Administration wanted to have its cake and eat it too. How unfortunate that the economic stimulus is working, that the Stock Market has been on the rise and that the Obama health care bill will only raise taxes on the top 2% of our country. It should be mentioned here, who drove our nation’s economy into the dirt? That would be George W. Bush. The same guy who lied us into war, who tortured prisoners and who took the Federal Government to its largest expansion in the history of our country. I’m still just a simple guy who happened to grow up in the south hearing racist comments all of the time, and this is still white supremacists racist commentary. So there you have sports fans and political pundits. Six months after Kit Lange peered into her cauldron, borrowing the eye of prophecy from her sisters, not one of her dire predictions has come true. Only one other group in the past 100 years has had a worse record than Lange’s; the Detroit Lions. “It’s Nancy Pelosi attacking the American people, it’s the Democrats comparing them to Nazis – the Democrats are doing that,” he said. Hannity has long been one of the conservative spin doctors, and now he’s trying to spin the hate from those who are yelling, and disrupting town halls across the country on to the victims. Sean? Sean? Anyone? Bueller? Sean? Bueller? There are people showing up at the town hall meetings carrying signs with swastikas, and “SS” symbols. They are screaming at members of Congress and not allowing those men and women to speak to their constituents. Gee, I don’t know? Just like the Brown Shirts of the Nazi party did in Weimar Germany to quash opposition. The Speaker of the House has not said anyone is un-American. Mr. Hannity has once again proven, all by himself, that he is a liar. President Obama Will Have Death Panels? Former Alaskan Governor Sarah Palin is claiming that President Obama is going to have Federal “Death Panels” that would enforce euthanasia on seniors or the disabled if his health care proposals are passed by Congress. No Sarah, there won’t be any Death Panels. No one is going to decide if Grandpa and Grandma Palin should be put to death, or if little Trig should be smothered by his own pillow. Enough of the shrill, right-wing, fear mongering. Enough of you Sarah as well, get thee to that Nunnery already. President Obama is Using Nazi Symbols? 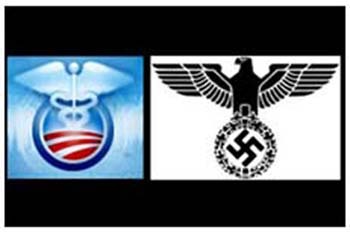 So Rush Limbaugh has now decided that President Obama is Adolf Hitler, and that the proof is that his health care plan symbol resembles the Nazi Eagle emblem from World War II. Does anyone else have a problem with Rush, Hannity, et al., trying to compare the current administration to Hitler’s Nazi regime? One very learned group certainly does. The Simon Wiesenthal Center is criticizing those who have injected Adolf Hitler into the discussion of President Obama’s health care plan. That would be? Let’s see? Oh, yeah, Rush, Hannity, et al., and a whole host of thug-like troglodytes hell bent on disrupting the free discourse of political thought and discussion. Gee, just like the brown shirted thugs of the Nazi Party did in Germany during the 1930s. So, who are the Nazis here? “It is prepostrous to try and make a connection between the President’s health care logo and the Nazi Party symbol, the Reichsadler” said Rabbi Marvin Hier, founder and dean of the Simon Wiesenthal Center. The Simon Wiesenthal Center is one of the largest international Jewish human rights organizations with over 400,000 member families in the United States. It is an NGO at international agencies including the United Nations, UNESCO, the OSCE, the OAS, the Council of Europe and the Latin American Parliament. Now Rush, for the sake of your logical argument, let’s take a look at other symbols in the United States and used by the government that might, just might, look a little more like the Nazi Eagle. And then this symbol looks a lot like the Luftwaffe symbol of World War II. There are a lot more symbols that could be thrown out as resembling something “evil”, just as Rush has done. Perhaps people should stop and think before comparing things to the symbols of the Nazi Party. But then again asking Rush, Hannity, et al. to stop and think might be asking too much. Mexican Immigration Numbers Drop to Ten Year Low? The number of Mexican immigrants who crossed the border dropped sharply in the past year to the lowest level in a decade, even while undocumented workers already here are opting to stay. A study, released recently by the Pew Hispanic Center, found that immigrants arriving from Mexico fell by 249,000 from March 2008 to March 2009, down nearly 60 percent from the previous year. But wait, how is this possible? How is it possible that the number of illegal immigrants entering the United States has fallen by the sharpest amounts in a decade during the Presidency of Barrack Obama? Wasn’t it George W. Bush who was supposed to be protecting our Southern Boarder with his wonderful fence? The annual inflow of immigrants is now 175,000, having steadily decreased from a peak of 653,000 in 2005, during the beginning of the second term of Bush/Cheney. The total population of Mexican-born immigrants in the U.S. also edged lower in the past year, from 11.6 million to 11.5 million, according to the study by Pew, an independent research group. Up to 85 percent of immigrants are believed to be in the country illegally. Another drop? How can illegal immigration be turning around under a Democratic President? • In 2008, the number of Mexicans apprehended by the U.S. Border Patrol — 662,000 — was 40 percent below the peak of 1.1 million in 2004, reflecting in part the sharp decline in the number of new immigrants arriving into the U.S. Why are fewer people trying to come into the U.S. after Bush/Cheney left office? Perhaps the whole “tough on illegal immigration” talk was simply a smoke screen? Perhaps the administration dedicated to making America safer was in reality a sieve through which hundreds of thousands of illegals poured through? • Mexico is by far the origin of most U.S. immigrants, accounting for one-third of foreign-born residents and two-thirds of Hispanic immigrants. About one in 10 people born in Mexico now live in the U.S.
• The total number of apprehensions by the Border Patrol in 2008 — 724,000 — was at the lowest level since 1973. More than 90 percent of people detained by Border Patrol are Mexican. So? Is it possible that President Obama’s Administration is tougher than Bush/Cheney’s? The findings come as the Obama administration has pledged to take up immigration law this year. A key Democrat in the effort, Democratic Sen. Chuck Schumer has said he hopes to have a bill ready by Labor Day and that the way to get it passed is to be tough on future waves of illegal immigration. Steven Camarota, a demographer at the Center for Immigration Studies, a Washington research group which calls for reduced immigration, said the findings demonstrate that tougher law enforcement can make a difference. Still, he said it will take a lot more than tighter border security to get comprehensive reform passed. So, the Obama Administration is tougher on illegal immigration than Bush/Cheney? But we’ve heard virtually nothing about this from Limbaugh, Hannity, et al? Aren’t they supposedly dedicated to telling us what no one else wants us to know? Aren’t they the true protectors of America and our way of life? Or, are they simply never going to admit that President Obama could be doing anything right?